“A thriving thoroughbred industry is vital to the state’s economy and to providing world class entertainment to spectators from around the globe,” said P.J. Campo, Vice President of Racing for The Stronach Group. Campo is referring to the world-class racing experience for both competitors and spectators and one of the world’s richest days of horse racing with the Pegasus World Cup. Thoroughbred horse sales, specifically the Ocala Breeders’ Sales, contribute strongly to the hospitality sector as buyers from as many as 49 states and 38 countries flock to the two-year-olds in training sales each spring. Horse sales in the state generated $156 million in revenue in 2016. “With over 113,000 jobs and a robust $6.8 billion in total impact, equines continue to have a notably greater economic impact than our signature spring baseball training. The study clearly supports the train of thought that the Florida thoroughbred business, along with our entire equine industry, are not only worth preserving but supporting and growing as well. Florida is most fortunate to have such an industry and agri-business already well established within its borders just as we Floridians are fortunate to live and work here,” Powell said. Incentive programs offered in Florida are a key to the industry and have grown in recent years. “Florida consistently ranks in the top two to three in foal crop annually. Incentives in the state from breeders’ and owners’ awards, to bonus money for races of all types give Florida-breds robust opportunities to earn more for their owners who have invested in them. The Florida Sire Stakes series promotes stallions standing in the state and gives FSS eligible Florida-breds going into the sales arena opportunities for their buyers to race in the prestigious series,” said Powell. The link will be managed by Luis Ocasio, a graduate of the University of Florida with a degree in Industrial and Systems Engineering as well as a graduate of the University of Puerto Rico with a Master’s Degree in Applied Mathematics. 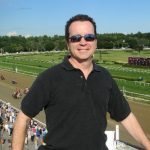 Ocasio has worked for Hipodromo Camarero racetrack in Canovanas, Puerto Rico since 2001, first as the Director of a daily publication containing news and past performances and the TV racing analyst for local and simulcast racing, and as the track’s webmaster since 2010. Camarero has not conducted horse racing since Hurricane Maria ravaged the main island in mid-September. Ocasio hopes to use his podcast to reach out to horsemen and racing fans who have moved to Florida since the disaster, as well as fans back home. “Many Puerto Rican horsemen have brought their horses to Tampa. The podcast will give them a way to receive information they can use to follow the races,” Ocasio said Wednesday from his home in San Juan, P.R. Ocasio plans to present a 20-minute podcast for each day’s racing program. “We want to keep it lively, informative and fast-paced,” he said. “My analysis will be more oriented to the horse’s pedigrees, action and speed figures. Watching replays and more replays – that’s where the value is found, and Tampa is all about VALUE. “The basic information will always be available, but I think there is a need to give people more than the horses’ names and numbers. Also, fan engagement and participation is a must,” Ocasio said. At Hipodromo Camarero, Ocasio, whose father Antulio Ocasio has been a Thoroughbred owner for 45 years, was responsible for developing code for a content-management system website that enabled owners to monitor their horses’ medication and services consumption. He has also worked in catalog sales production, with Serie Hipica del Caribe‘s website, www.clasicocaribe.org , and for a tournament website. His expertise in website development and his racing background promise to offer the best of both worlds to Spanish-speaking fans. “There are so many Hispanics interested in horse racing, not only Puerto Ricans but people from Central and South America countries, which illustrates U.S. horse-racing’s evolving demographic structure,” he said. Additional purse and bonus monies for seven stakes – including the Grade II, (now)-$400,000 Lambholm South Tampa Bay Derby for 3-year-olds on March 10 – are being made available through Florida Thoroughbred Breeders and Owners Association’s (FTBOA) stakes funding and sponsorships by the FTBOA’s Florida Sire Stakes program. The lineup features a $50,000 increase in the total purse for the Lambholm South Tampa Bay Derby, won last season by subsequent Belmont Stakes Presented by NYRABets winner Tapwrit. The Festival Day card will consist of five stakes races worth a cool aggregate of $1-million, a Tampa Bay Downs single-day first. The stakes schedule, announced by Tampa Bay Downs Vice President-General Manager Peter Berube, includes three graded stakes apiece on both the March 10 Festival Day program and the Feb. 10 Festival Preview Day presented by Lambholm South card, which is highlighted by the Grade III, $250,000 Sam F. Davis Stakes. The Lambholm South Tampa Bay Derby has produced the winners of three Triple Crown races. In addition to Tapwrit, Street Sense won both the Tampa Bay Derby and the Kentucky Derby Presented by Yum! Brands in 2007, while Super Saver won the 2010 Kentucky Derby after finishing third in the Tampa Bay Derby. 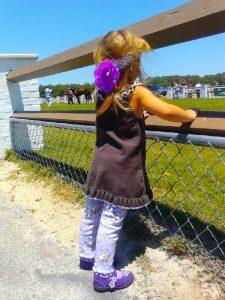 “Not only are we offering more stakes than ever, with more available purse money, our schedule include races for all ages and types of horses on both dirt and turf,” Berube said. “We are proud of our record of attracting horses capable of winning at the highest level of the sport and pleased to offer our fans such a high quality of racing. “A lot of credit goes to our track maintenance staff, headed by (Vice President of Facilities and Track Surfaces) Tom McLaughlin,” Berube said. “Year after year, many of the top trainers who send horses here, as well as our locally-based trainers, have expressed their satisfaction at the consistency of our deep, sand-based main surface and the immaculate condition of the turf course and their desire to compete at Tampa Bay Downs. “We also strive to position our stakes races on the calendar to give horsemen the best opportunity to prepare for other major races across the country, which creates a ‘win-win’ scenario for them and for our fans who love seeing the big horses in their backyard,” Berube added. The purse for the Hillsborough, won in 2016 by the subsequent Eclipse Award Champion Grass Mare, Tepin, has been increased from $200,000. The track’s Festival Day program also includes the $100,000 Challenger Stakes and the $75,000 Columbia Stakes, the latter on the turf, rounding out the million-dollar stakes cornucopia. As mentioned, the Feb. 10 Festival Preview Day Presented by Lambholm South card is led by the Sam F. Davis Stakes, which serves as the traditional prep race for the Lambholm South Tampa Bay Derby and has produced numerous Kentucky Derby Presented by Yum! Brands starters. The lone non-graded stakes on the Feb. 10 card is the $150,000 Suncoast Stakes for 3-year-old fillies, which features a $50,000 purse boost and has been added to the “Road to the Kentucky Oaks” points series. 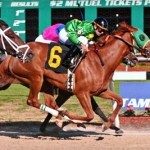 Churchill Downs added the Suncoast to the “Road to the Kentucky Oaks” roster soon after Elate (the runner-up to Tapa Tapa Tapa in last season’s Suncoast) won the Grade I Alabama Stakes at Saratoga in August. Elate’s Alabama triumph marked the third consecutive year a Suncoast participant went on to win a Grade I event, joining 2015 Suncoast winner Include Betty and 2016 winner Weep No More. A quartet of first-year stakes funded by the FTBOA will provide an additional $450,000 in purses for eligible Florida-bred horses. On Dec. 16, Tampa Bay Downs will play host to the $125,000 FTBOA Marion County Florida Sire Stakes for 3-year-old colts and geldings and the $125,000 FTBOA City of Ocala Florida Sire Stakes for 3-year-old fillies, both at a distance of seven furlongs on the main track. Then, on May 5, as part of the Kentucky Derby Presented by Yum! Brands festivities at Tampa Bay Downs, two stakes will be contested: the $100,000 FTBOA Silver Charm Florida Sire Stakes for 3-year-old colts and geldings and the $100,000 FTBOA Ivanavinalot Florida Sire Stakes for 3-year-old fillies. Both races will be contested at a mile-and-40-yards on the main track. The Dec. 16 program is the track’s annual Cotillion Festival Day, which includes the $100,000 Inaugural Stakes for 2-year-olds and the $100,000 Sandpiper Stakes for 2-year-old fillies, both at a distance of six furlongs. Cotillion Festival Day is a natural lead-in to the track’s Skyway Festival Day program on Jan. 20, featuring the $125,000 Pasco Stakes for 3-year-olds and the $125,000 Gasparilla Stakes for 3-year-old fillies, both at a distance of seven furlongs on the main track. 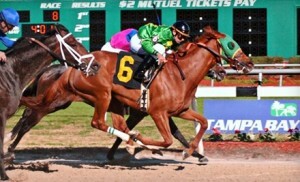 Both the Pasco and the Gasparilla enjoy $25,000 purse increases. The 16th edition of the track’s Florida Cup, featuring six races worth $100,000 apiece for Florida-bred horses, will be contested Sunday, March 25. The Florida Cup, which has seen such recent winners as multiple Grade I-winning star World Approval, offers three main track races and three turf races for males and females. All told, the 2017-2018 stakes schedule features eight multi-stakes programs. 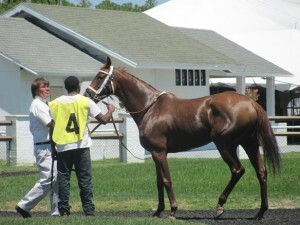 Tampa Bay Downs will open its barn area on Monday, Oct. 30, with training to commence on Nov. 6. The 2017-2018 season, which officially began July 1, is set to resume on Saturday, Nov. 25. PACE SCENARIO: Honest to fast pace with State Of Honor, donning blinkers on and the rail, and Wild Luck and Chance Of Luck all wanting the front end. Sitting behind the trio will be Fact Finding. This track typically favors runners with tactical speed. Spot Play? #3 FACT FINDING is a rare undefeated Todd Pletcher 3yo who is not the headline in an early Kentucky Derby prep. That belongs to favorite McCraken, who I feel is vulnerable breaking from a bad post and spotting weight off the layoff. FACT FINDING has crushed his competition in all three starts and trainer Todd Pletcher has tremendous success in recent years at Tampa Bay Downs. I look for this one to sit a perfect trip behind the pace before taking over and drawing off on the turn for home. He’ll hold off the closers. View some of Rich’s top recent highlights such as $25 Arrogate in the 2016 Travers! Moonlit Meteor stalked the early leaders, took command around the quarter pole and sped to an easy 7 length victory in the fourth race at Tampa last Thursday afternoon. Moonlit Meteor has been named the agameofskill.com Claimer of the Week. The chestnut gelding returned $5.20 to his backers once his tenth career victory was made official. The son of Malibu Moon covered the six furlongs in 1:10.61 while defeating his fellow $5,000 claimers. The 8 year old was ridden by Manoel Cruz and is trained by James Tsirigotis. Owned by Julie Perez, Moonlit Meteor has finished in the money (top three finishers) an impressive 17 times from 22 starts and has now earned more than $113,000 in lifetime earnings. 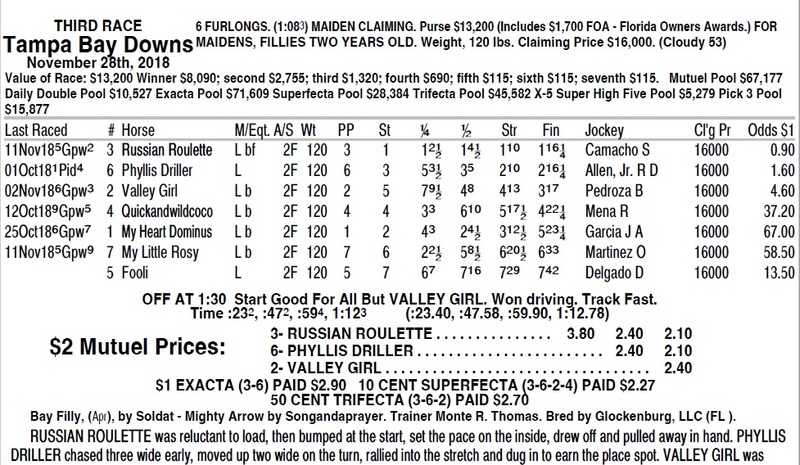 Save time and let the One Minute Handicapper look for all the handicapping angles! 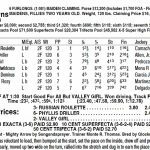 OMH Worksheets available for Gulfstream Park – Thurs., Dec. 6th – $5 for the full card. OMH Worksheets available for Gulfstream Park – Friday, December 7th – $5 for the full card.